Tiree Mailing List. A RootsWeb mailing list is available to everyone interested in the genealogy or history of the Isle of Tiree. To begin the registration process, send an email to sct-arl-tiree-request@rootsweb.com with the single word subscribe in the subject and message fields. As a subscriber you can seek help with your family research, help others with their research, ask questions, initiate or participate in discussions, or just listen. You might also consider subscribing to the Coll Mailing List. 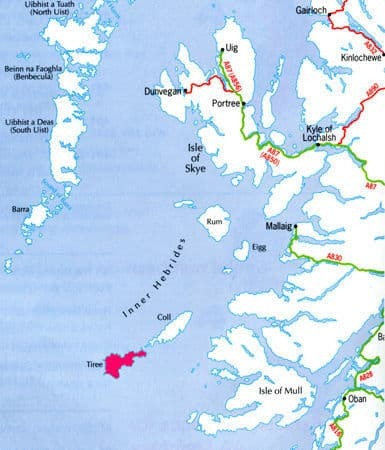 Coll is the near neighbour of Tiree (the two islands are sepatated only by the narrow Gunna Strait) and had close family ties with Tiree. To subscribe to the Coll list, send an email to sct-arg-coll-request@rootsweb.com with the single word subscribe in the subject and message fields. With special thanks to: Alexander Straker, Allison McKinnon, Andy Straker, Angus MacKinnon, Angus MacLean, An Iodhlann, Ann Hentschel, Anne Maye, An Tirisdeach, Archie Henderson, Argyll & Bute Council, Barbara Hall, Barbara Humphrey, Betty MacDougall, Bill Clarke, Billy Clelland, Blue Beyond, Brenda Dougall Merriman, Brian Anderson, Brian Wills-Johnson, Catriona McLeod, Catriona Smyth, Chris McKinnon, Colin Woodcock, Darryl Stout, Deborah Robertson, Dena Palamedes, Donald MacFadyen, Duncan Grant, Esther MacRae, Eugene Quigley, Fionnadh, Flora MacDonald, Flo Straker, Frank Bigwood, Gail Röthlin, Garth Bray, Gene Lamont, Glenda McPhadden Franklin, Gordon Scott, Hilda Downey, Ian Cameron, Iain Campbell, Ian Phillips, Ian Scott, Ida King, Irene Kerr, Jackie Davenport, Janet Bowler, Jean Little, John Holliday, John Livingstone, Jean McLean, John McLean (Scotland), John McLean (Australia), John Read, Julie Leibrich, June Ridgeway, Linda Brackenbury, Linda Temple, Lloyd Pitcher, Louise MacDougall, Lynn Clark, Marina Campbell, Markus Röthlin, Mary MacLean, Melda Brunette, Michael Ford, Michele Fermanis-Winward, Moira Kerr, Mona MacDonald, Morag Straker, Mull Genealogy, Nanette Mitchell, National Archives of Scotland, Patricia McEachern, Robin Pitcher, RootsWeb, Russ McGillivray, Sandra Lofthouse, Sandra McEachnie-Lake, ScotlandsPeople, Sharon Clayton, Simon Wellock, Sue Cameron, Terry Sheppard, Val Read, Valerie Bowden, Vega Bray, Vickie Ewing & Wayne Cameron. About copyright. Everything on this website is provided freely in the interests of genealogical research. It is all protected by copyright, so articles or charts must not be copied and reproduced in other publications without the consent of the author(s) and the website administrator. 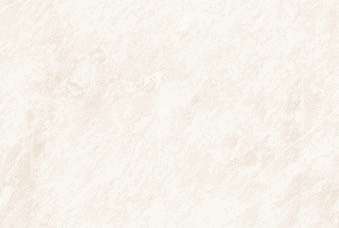 Copying for personal research or study is permitted. If you use information from the website in your own writings it would be appreciated if you could acknowledge the author(s) and source. On this website there are a number of pages, reached by clicking on the blue links, giving information contributed by people interested in genealogy and the history of the Isle of Tiree. It shares some pages with its 'twin' website, Isle of Coll Genealogy. 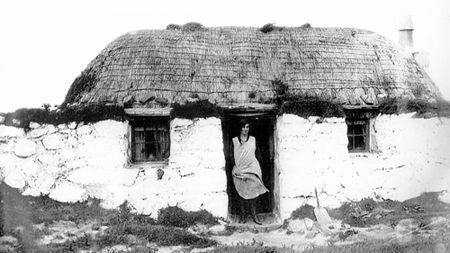 Tiree History A collection of scholarly articles on Tiree from pre-historic times to 1900, including the Viking age, the demise of the Macleans and rise of the Campbells, and the famine years of the 1840s and the mass emigrations that followed. Births, Baptisms & Marriages Transcripts and indexes of baptisms and marriages in the Tiree Old Parish Registers 1766-1854, and civil registrations of births 1855-1875. Churches in Tiree & Coll Short histories of the Church of Scotland and other Christian churches in Tiree & Coll, and an explanation for why some records are missing in Old Parish Registers. Statistics of Tiree & Coll A series of articles relating to the economy, population, land types, farm practices and estate management of Tiree & Coll in the 1700s and 1800s. Tiree Cemetery Records Photographs and inscriptions of gravestones in the cemeteries at Soroby and Kirkapol, Tiree, with a searchable (Excel) index of names. New entries are welcome at any time. Napier Commission A series of articles on the Napier Commission of 1883/84, which inquired into the conditions of crofters and cottars in the Highlands & Islands, and its aftermath, including the Tiree 'Crofters' War' of 1886. The articles include one by the 8th Duke of Argyll describing the management of Tiree from 1753 to 1883. Genealogical Records Detailed records of ancestors and descendants of Coll and Tiree families from early times to their expansion in Coll and Tiree, and their further expansion in Canada and the USA after the mass emigrations of the 1800s. The records include those for the McPhadens of Coll and Tiree, and the Macleans of Tiree. Argyll & Bute Archives Indexes of family history documents held in Argyll & Bute Council Archives, Lochgilphead, Scotland, and links to transcripts of selected documents. Tiree Censuses Searchable databases of Tiree censuses of 1776, 1779, 1841, 1851, 1861, 1871, 1881, 1891 & 1901. (Microsoft Excel or Excel Viewer is required to view the data). Research Interests Registers of Tiree surname interests and of people researching ancestral families or ancestral homes in Tiree. New entries are welcome at any time. Overseas Cemetery Records A list of grave sites and gravestone inscriptions of people born in Tiree who emigrated to and died in other countries. New entries are welcome at any time. Also on this page is the guide Discovering the Scotch Cemetery, Brock Township, Ontario, Canada, by Garth M Bray. Emigrant Ships Passenger lists of emigrants from Tiree or Coll to Canada or Australia in the 1800s. Emigrant Stories Life stories of individuals or families that emigrated from Tiree or Coll and settled in the mainland or in overseas countries. New entries are welcome at any time. Mariner Records Searchable spreadsheets listing Tiree-born merchant seamen and the ships in which they served for the years 1845-1920. New entries are always welcome. Also linked to this page are articles celebrating the life and achievements of famous Tiree mariners, including Captain Donald MacKinnon of the Taeping. Ships & Captains Articles about merchant ships, sea trade and famous Tiree-born captains of the 1800s. Family Trees A register of internet addresses of family trees that originate with Tiree ancestors. New entries are welcome at any time. Born in Tiree Information on people born in Tiree and later reported in censuses or other official records as residing elsewhere in Britain. Tiree Map A present-day map showing the location of townships, geographical features, museums, display centres, and other visitor attractions. The map is by Colin Woodcock, Blue Beyond Studio, Balemartine, Tiree, and is reproduced with his permission. Scenes of Old Tiree A collection of black-and-white photos showing buildings, scenes or farming practices that our ancestors would have known in the 1800s. New entries are welcome at any time. Place Names Gaelic and Norse derivations and meanings of modern-day township and other place names in Tiree. Old Word Meanings Meanings of unusual words or abbreviations that might be encountered in old parish registers, early censuses, rental records, or other old documents. Poems, Stories & Songs Poems, stories and songs about Tiree or its people. New entries are always welcome. Obituaries & Personals Transcriptions of obituaries and personal notices in overseas newspapers for people born in Tiree, in many cases with added background notes about the subject person sourced from church and civil records. Alternative Forenames A list of some common forenames in old parish registers or census returns that may be recorded differently in later Scots or overseas documents, such as the forename recorded as Marion in Scotland but as Sarah outside Scotland. Coll Genealogy A link to the 'twin' website, Isle of Coll Genealogy. Links A list of websites relating to Tiree or nearby islands. Tiree, the most westerly island of the Inner Hebrides group off the west coast of mainland Scotland, is small and flat, about 20km long and 2-12km wide, and completely treeless.There is evidence of Stone Age and Iron Age settlements, and Celtic and Viking occupations. Viking influence lasted until the mid 1200s, and many Norse place names still survive on the island. After the defeat of the Vikings, the island again came under the control of Gaelic-speaking peoples, at first the MacDougalls, then the MacDonald Lords of the Isles, and then the MacLeans. There were conflicts between the MacLeans and the mainland Campbells, and in the 1600s the MacLean estates in Tiree and Mull were taken over by Archibald Campbell, Earl of Argyll. Tiree has remained under the ownership of the Campbells, Dukes of Argyll, since that time. The Gaelic language has survived in Tiree, as have the Gaelic traditions of song, poetry and storytelling. Over 40% of present-day islanders are fluent speakers of Gaelic and it is taught to children as a second language in the island's schools. The island's population peaked at about 5,000 in the 1800s and today is about 700. The early islanders survived by farming and fishing, but at little more than subsistence level. For centuries Tiree had been a grain producing island, but from the 1700s onwards the islanders began to rely more on potatoes than on cereal meal as a staple food. 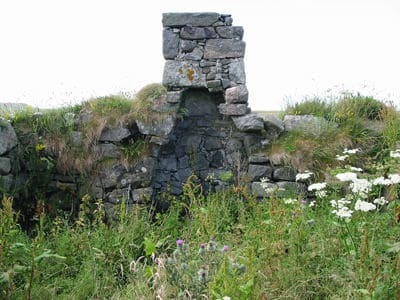 With the outbreak of potato blight in the late 1840s, which devastated crops in Scotland as well as Ireland, the people of Tiree experienced a number of years of severe famine. Even before the famine years of 1846-1854 Tiree had become seriously overpopulated. The population had increased from 1,500 in 1750 to almost 5,000 in 1840, by which time many island people were living in severe poverty. The 8th Duke of Argyll, when he succeeded to the estate in 1847, wrote that Tiree had "a vast semi-pauper population". He became an enthusiastic advocate of assisted emigration to relieve the situation. From 1847 to 1853, 1,354 Tiree people were assisted to emigrate, principally to Canada, and an unknown number of others left for the mainland. It was claimed that this was "a purely voluntary emigration", but there is evidence that the poorest people were targeted by persuasion or coercion. Summonses of removal were issued against 174 tenants on the island and others were "warned" of removal. Between 1847 and 1861, the number of small tenancies, those paying an annual rent of less than £5, declined from 242 to 52. The Duke's Tiree estate manager, or factor, was Colonel John Campbell, known on the island as the 'Big Factor' or the 'Black Factor'. He was energetic in implementing the Duke's policy of raising rents, evicting those in arrears, and arranging assisted passages to overseas countries. The houses of evicted families were burned, and islanders caught giving shelter to these people risked being evicted themselves. You can find the ruins of their houses, now just piles of stones overgrown with grass, in the fields around the present-day townships. Today the population of Tiree is about 700, but there is a much larger community, estimated at about 38,000, scattered around the world, mainly in Canada, Australia or New Zealand, who are descendants of Tiree emigrants. Our ancestors may have been coerced to emigrate; in their new homelands they may have been called 'primitive' because they spoke Gaelic as their first language and were not proficient in written English; but they and their children were the builders of new nations.